Show your love for your royal pet and bring them home with a Crown Heart Small Engravable Pet I.D. Tag in Chrome and Red! The Crown Heart Small Engravable Pet I.D. Tag in chrome and red will show the world that your cat or dog is royalty and should be handled with care. 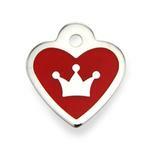 This bright red little heart will sit next to his or hers and proclaims that your pet is royalty. To illustrate this point, this lovely tag features a shiny chrome heart with red inlay with a beautiful chrome crown. On the back, it's a solid chrome color. This is where your personalization will appear. On this small heart design, we recommend keeping the engraving simple to increase legibility. 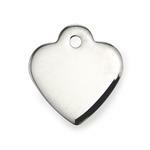 The small size of this luxurious tag is ideal for toy breeds, puppies, and cats. The bright red is eye catching and easy to spot. It pairs beautifully with many of our collars to make your little pet feel like a king or queen! Responsible pet owners I.D. their pets. Don't let your pet leave your house without I.D. so he or she knows how to get back. Made of brass, plated with chrome and epoxy filled. Look for other charms to enhance your tag bling. Posted On 01/14/19 by Michelle B from Huntsville, AR Yes, Michelle B recommends this product! Perfect ID tag for my little chihuahua, has held up great! Posted On 11/09/18 by Michelle B from Huntsville, AR Yes, Michelle B recommends this product! Love this ID Tag, the red is very vivid as pictured, perfect size for my 5 lb chihuahua baby. Posted On 07/19/17 by Linda G from Grovetown , GA Yes, Linda G recommends this product! Posted On 06/28/17 by Kristin M from Pleasant Lake, MI Yes, Kristin M recommends this product! Nice quality and good engraving! Would recommend! Posted On 06/22/17 by Katie W from Symsonia, KY Yes, Katie W recommends this product! I love this tag. Its shiny silver with red accent. Bought for my poodle Mollie. Still readable after years. Posted On 04/01/17 by Ann M from Sun prairie, WI Yes, Ann M recommends this product! This is bright red and the engraving is perfect. Looks just right on her red collar....she is a Princess. Posted On 02/11/17 by Jan K from Peoria, AZ Yes, Jan K recommends this product! This is adorable but teeny. Good for a super small dog or puppy. Posted On 07/28/16 by Yana S from Culver City, CA Yes, Yana S recommends this product! Looks just like the picture and is excellent size for my Yorkie Poo. Posted On 07/06/16 by SARAH M from LONDON, Yes, SARAH M recommends this product! The engraving looks very nice. Posted On 06/17/16 by Karen M from San Jose, Yes, Karen M recommends this product! Just like described. Super cute for my Westie! Im very happy to see I could shop by breed, That made it a lot easier. Also your sizing guide was very easy to understand.